In a lost world called Sakura, there’s a secretly guarded Japanese Cherry and according to some myths, it hides a fortune which is only known by a princess. She stays along the 5-reels and 40 Paylines video slot to fight any evil characters that attempt to rob this ethereal land from its wealth of riches. Come along and with every spin of the reel, discover its reams of surprises. Play anywhere and anytime on your mobile or tablet to score some epic potential wins. Guess what! Here on the wonderful Sakura Fortune Slot, the gameplay is not just easy but it’s entertaining too. Yes, with its betting options that help you to customize your spinning event, you will have a whale of a time. To add flavour to these reels, you will find a bunch of Japanese related signs that are stupefying like the three characters that consist of a woman and two men, a jade lion and a golden dragon. On the other hand, the lower value symbols are made up of 4 traditional coins of different colours. Bet Levels: On this Quickspin game, there are no Bet Levels. Amount of Paylines Selection: : You will find up to 40 Paylines and they are all fixed on Sakura Fortune Slot. Coin Values: There are no coin values. However, you will find the Total Bet and it ranges from 0.20 to 100.00. The wild symbol is represented by the elegant princess in red attire. She can come along stacked to wrap all positions on that particular reel and note that the princess only comes on the scene on reels 2, 3 and 4. The wild symbol can substitute all the symbols on the reels to help create winning combo. 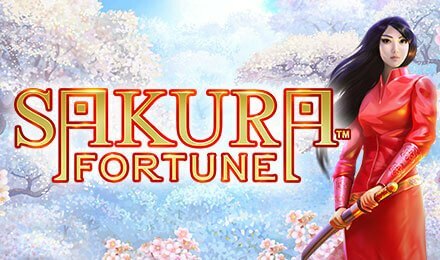 The Scatter is the fan and it is crucial to launch one of the rewarding features on Sakura Fortune Slot. This feature is activated when you land 2 full stacks of the princess wild symbols on reels 2, 3 or 4. Now, you can be granted with 2 free spins and the wild symbols will freeze in their position but there’s more. You can bask in more spins on Sakura Fortune Slot if you land more wilds unto the reels. In the event two wilds land in the base game, you will have the chance to nudge the symbols into full stacks and thus activate this feature. The Free Spin Feature is activated like this: Get 3 or more fan scatter symbols land in adjacent rows that starts from the left-hand side and this will initially bestow you with seven free spins. But each wild princess that parks onto the reel of Sakura Fortune Slot will award you with an extra spin. In addition, the wilds will turn bigger to cover the entire reel.